I never had any doubt that paying under £140 for a 3D printer would yield anything other than a project. Some things have worked better than expected, some worse. The frame is made from 8mm laser cut acrylic. Acrylic has one feature that is not very good for this particular application:- it bends! The X and Y axis are driven by toothed belts which require a fair degree of tension to work. 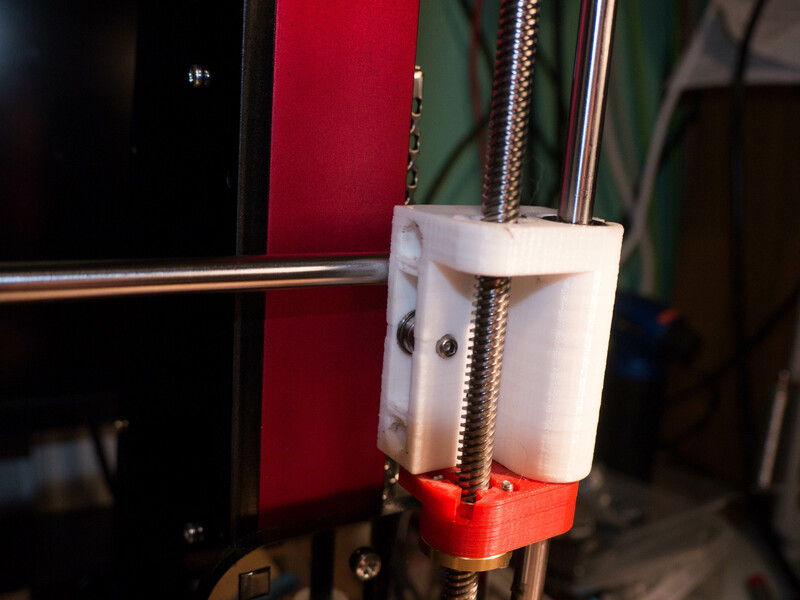 And by applying tension, especially to the Y axis belt, you can really bend the frame! It did not take much force to bend the frame. Another feature of the bendy frame is the whole printer wobbles as it prints. The default travel speed is 100mm per second and there is quite a mass moving about on the X axis. 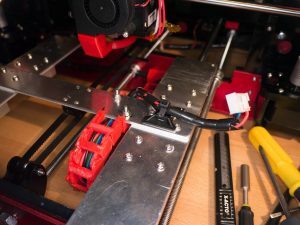 There are a lot of designs out there for printed braces to make the frame stronger. But I had some 50x50x3mm aluminium angle extrusion to hand! That should make the frame a lot stiffer! A quick painting later and we’re getting somewhere. A lot less frame flex! And I could also set the frame square and have it stay in place. After doing some searching I decided on this Y belt tensioner. It actually pulled in line with the belt and has a neat dovetail feature to stop it slipping off. I also printed this Y belt holder, which fits under the build platform and holds the belt at just the right height. The stock Y belt securing method is far from ideal. 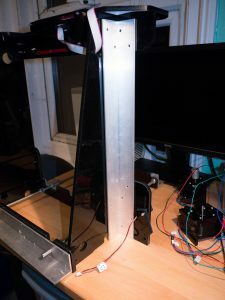 Another problem I identified is that the whole weight of the X axis assembly is sitting on the two Z axis lead screws. At the bottom of each one is a ‘springy’ flexible coupling. 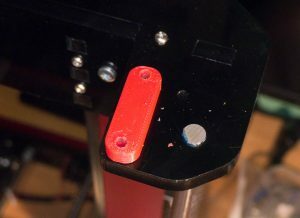 These are needed as the stock X axis support parts are WAY out of alignment as seen in my first post. 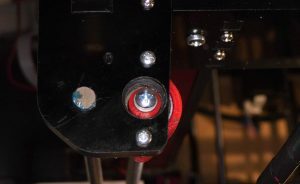 The problem is that as the X axis moves, the centre of mass moves too causing the flexible couplings to compress and release allowing quite a bit of movement up and down. As your layer height is only 0.2mm this causes quite a problem! There is more than 0.2mm of movement in the couplings. So my solution was to hang the Z axis lead screws from a bearing at the top. 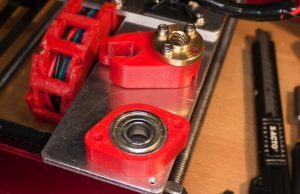 Skateboard bearings are prefect, plentiful and cheap. Search ebay for 608-ZZ. I also went to a floating lead screw nut holder. The bearing holder is my own design. I will publish these once I’m happy. 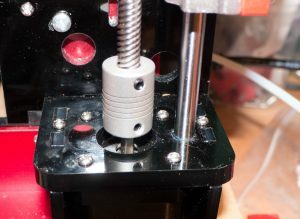 I have a metalworking lathe so drilling and tapping the leadscrews with an M4 thread was easy. 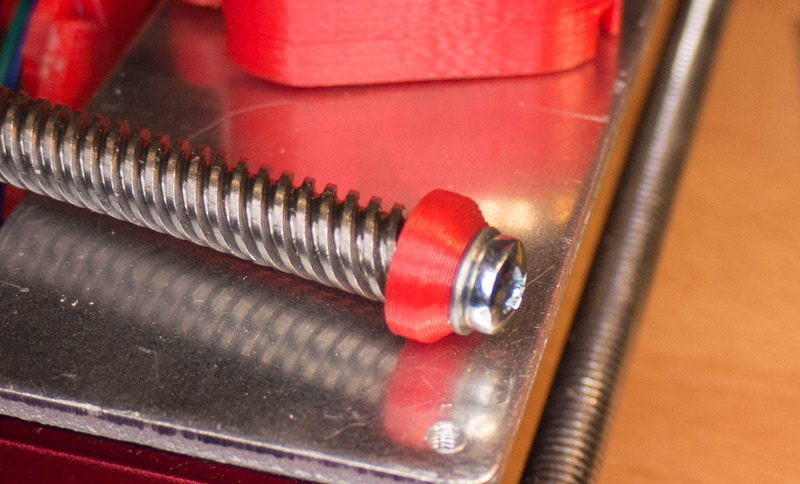 Also the leadscrews are not hardened, so be careful with them. I 3D printed the cap just cos. 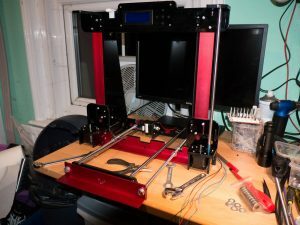 These two mods made the X axis assembly much more predictable. The next problem was that the parts holding the X axis rods were seriously out of line! The supplied 3D printed parts were not of the best tolerance. The right hand part was OK. It would hold the X rods very nearly parallel with the build bed. The left hand part was.. well.. crap! The X rod drooped over 5mm across the width of the printer! This picture was taken with both of the X axis supports at exactly the same height from the base. You can see the rod misses the top hole by quite a margin. The result of this is that the right hand end of the X assembly was taking the majority of the load as it was having to twist the left hand end to get the two rods parallel with the base. This had the detrimental effect of causing the right hand lead screw to slip when the stepper motors were turned off. Making setup for a new print VERY frustrating! 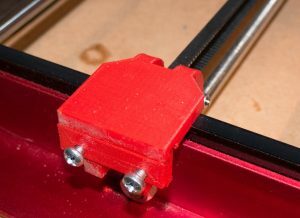 My final tweak was to make a cable chain for the heated bed. I picked one that went under the bed rather than beside it. Yes, I broke it fitting it and resorted to screws! PLA is not that strong and I didn’t enable supports for the overhang. Beginners mistake. Much neater than before but be warned, it squeaks! Some dry film lubricant solves that. 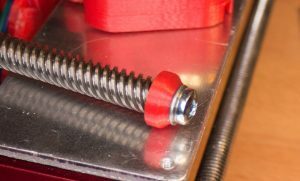 A better print cooling duct is also a good thing to make. Much neater prints.